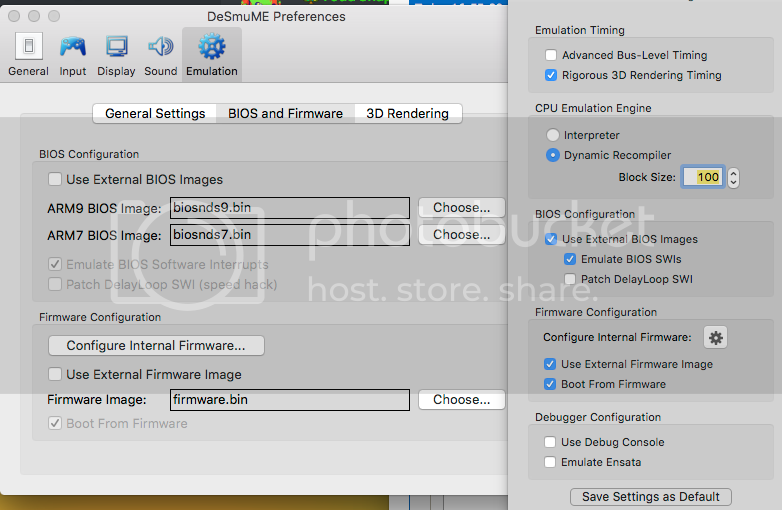 » Running the DS Home Menu on Mac? Running the DS Home Menu on Mac? Hello I am a new user, working on Mac only. I need to be able to run the DS menu before each Rom startup. I have loaded the BIOSnds7 & BIOSnds9 files, as well as firmware file. I looked all over for further instructions, but searches yield outdated discussions, and your only relevant link under homebrew in the knowledge base is dead. (I know little about Howmbrew, except that it can be used as a home software, in addition to develpining your own softwares) I need to know right away if it is possible for me to run the rom from the home menu. Otherwise I will seek a different emulator or abandon my emulator search all together. I only need this for a presentation, and I already have a back up plain. So let me stress although it is not critical that this issue be solved, it is critical that it be answered as if it is a possibility. 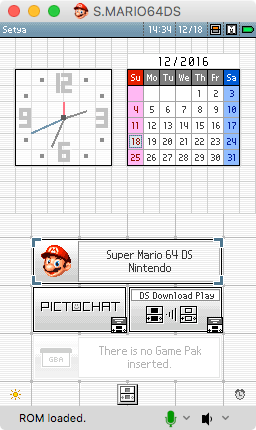 Re: Running the DS Home Menu on Mac? dunno, that's a detailed question for the mac port author. you better write which desmume version youre using. But is the "Boot From Firmware" option active or grayed-out? If it's grayed out, then you won't boot from firmware regardless of whether it's checked or not. - Enable "Use External BIOS Images"
- Enable "Use External Firmware Image"
If you meet all of these requirements, then you will be able to boot from firmware by enabling "Boot From Firmware". 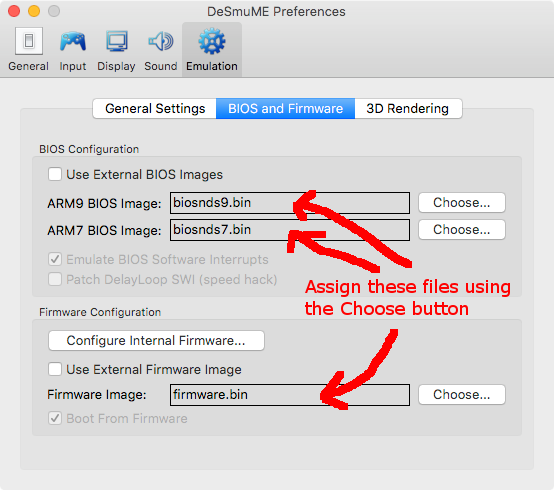 All options in the the BIOS and Firmware section of the Emulation tab of preferences are active and checkable. I still believe it may be the files... they wouldn't load the way I downloaded them. The ARM9 & ARM7 were .rom files and the program refused to select them. I changed the extension to .bin and they were accepted. I really can't think of much else, I could screen shot all my settings, or alternatively list them to see if you think any are interfering with the process. oh, what about the folder set up? Is it need to be in a special order or location? I simply created one master file in applications for desmume and al related files. The very last thing I can think of is, there isn't any file to click to start up with to open the home menu huh? Like, when I want to play any of the roms, I can just open the file directly. You can't do that with the home menu, right? You just have to open the app its self? Because if there is a file to open it, I don't have it. I havent used the mac port, but I dont think that's right. You must open an NDS game to boot the system and then it will boot into the home menu first (when youve enabled that option). Desmume doesnt start until a game rom is loaded. Just load the ROM like you normally would. Except if "Boot From Firmware" is enabled, then DeSmuME will start off in the NDS menu (with the game loaded) instead of starting into the game directly. It all works fine for me in v0.9.11. Just follow the requirements I gave you in my last post. No, its still not working... just loads directly to the game. What about the Slot manger? or other settings? Such as general and 3D rendering under Emulation? 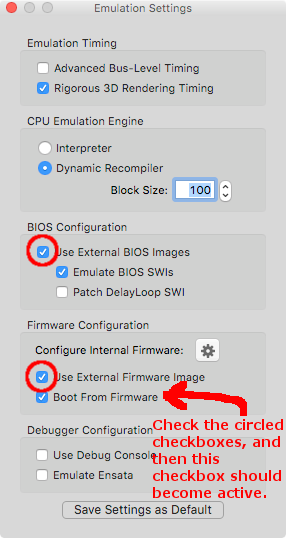 There are no other settings that are relevant to "Boot From Firmware". The only settings that are relevant are the five requirements that I listed. Post a screenshot of your Emulation Settings panel. I have a very strong suspicion that you're grossly misunderstanding something here. also: are you picking all these settings and THEN loading the game rom? 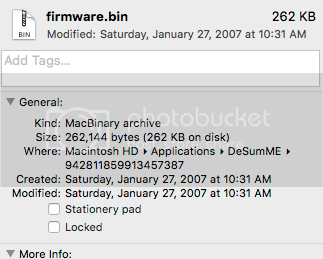 Okay I have my 3DS SD card loaded on my Mac, Can I find a compatible firmware file there? A search yields no file by that name. OSX measures files weirdly. That's 262 thousand bytes, which is 256KiB which practically everyone calls 256KB because only idiots and hard drive manufacturers use KB to mean anything but KiB. So your file is the right size. Now I'm unsure what your 3ds SD card has to do with the NDS. And firmware isn't stored on SD cards. Hum the 3DS was a long shot to try to find correct firmware, Are you sure about the file size? Well then by all reasons it should be working and it isn't. So Ive borrowed my brothers low quality laptop. Its a hybrid of 32 bit Win and some kind of Lunix. IDK my dad reprogrammed it, savaging it after it got a virus. I could ask him I'll be visiting him for the Holliday. Anyway, I loaded Desmume's 32 bit version and the roms on the laptop but the roms are cause the program to crash. I can't open any of the games I need to. sounds like he didnt get the virus off of it, or else literally every single file youre trying to load into desmume are broken garbage. try disabling the security software, or changing the 3d renderer or display method before loading a rom. My dad is an actual computer teacher. He can build computers. He fixed it. After tinkering with file locations, as well as emulations settings and 3D rendering I was able to not only get it to load the rom, but load the home menu as well. My issue is solved. Thank you for helping.